As kids, many of us dreamed of being a pro athlete. We played out those dreams in backyards, school yards and outdoor skating rinks. The problem becomes, we don’t have the elite skill set to make these dreams come true. See to Play: The Eyes of Elite Athletes gives average Joes that chance. The athletes that make it to the top of their sport do so because of superior visual traits. 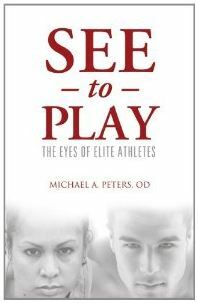 Written by Michael Peters, O.D., eye doctor for the NHL’s Carolina Hurricanes, See To Play examines through an expert’s eyes the vital role vision plays in the development of athletes and breaks down the visual system into its basic components. Readers will learn why elite athletes are able to perform at that high level and they’ll be given exercises to help them reach their genetic potential. Dr. Michael Peters has been the Team Optometrist for the Carolina Hurricanes since 1997. Currently, he also assists in optometrics for the Tampa Rays, Durham Bulls, and Carolina Rail Hawks. Review - Okay, so this is not a hockey book per se, and maybe I found it easy to invest myself in. Maybe that's because I have my own degenerative eye disease. I can definitely see how aspiring athletes with vision problems would want to consider reading this book though. The book reads really easily. Dr. Peters establishes himself early as open and trustworthy and comes across as really likeable guy who truly understands a) vision issues and b) athletes of every level, from amateur to elite to professional.. That is because he was once a promising football player himself. Peters is able to help the reader better understand his or her challenges and recommend exercises and courses of action to improve their vision specifically for the athlete (though I think I might try incorporating a couple into my own sedentary life). If you are an athlete who is affected from anything as simple as near-sightedness or serious as injury or disease, this book is definitely worth a look. It might just give you the edge you need to enjoy your sport that much more.